After carefully ingesting the new JAMA egg study that has gotten the media and many patients in a tizzy I consumed a three egg (of course with yolk) omelette. I am happy to report that I survived the incident and am not concerned at all that my longevity has been compromised. My 2013 summary of eggs, dietary cholesterol and heart disease (see here) is still valid and I highly recommend patients and readers read that post plus my updates on eggs with newer data (see here and here) rather than information related to the new egg study. Although CNN and other news outlets lead with an inflammatory headline suggesting that eating those 3 eggs increased my risk of heart disease the new egg study could not possibly prove causation because it was an observational study. First, the study relies on data collected from a food frequency questionnaire. Have you ever sat down and tried to recall exactly what you ate in the previous week? How accurate do you think your estimate of specific food items would be? In lieu of measuring actual dietary intake, epidemiologists collected millions of unverified verbal and textual reports of memories of perceptions of dietary intake. Given that actual dietary intake and reported memories of perceptions of intake are not in the same ontological category, epidemiologists committed the logical fallacy of “Misplaced Concreteness.” This error was exacerbated when the anecdotal (self-reported) data were impermissibly transformed (i.e., pseudo-quantified) into proxy-estimates of nutrient and caloric consumption via the assignment of “reference” values from databases of questionable validity and comprehensiveness. These errors were further compounded when statistical analyses of diet-disease relations were performed using the pseudo-quantified anecdotal data. These fatal measurement, analytic, and inferential flaws were obscured when epidemiologists failed to cite decades of research demonstrating that the proxy-estimates they created were often physiologically implausible (i.e., meaningless) and had no verifiable quantitative relation to the actual nutrient or caloric consumption of participants. In addition to unreliable initial data the subjects were followed up to 30 years without any update on their food consumption. Has your food consumption remained constant over the last 30 years? Mine hasn’t. I went from avoiding eggs to eating them ad lib and without concern for my cardiovascular health about 5 years ago after looking at the science related to dietary cholesterol. Observational studies like this one try to take into account as many factors as they can which might influence outcomes. Invariably, however, there are factors which are unaccounted for, indeed unknowable, which could be influencing the results. Individuals who were avidly trying to follow a healthy lifestyle in 1985 likely had drummed into their heads the message when these questionnaires were filled out that they needed to limit egg consumption. These individuals were also likely following other healthy habits, including exercising more, smoking less, and eating more fruits and vegetables and less junk food. Observational studies cannot account for all these confounding variables. At science-media centre.org they do a fantastic job of having independent experts in the field present their evaluation of scientific studies which have been popularized in the media. For the JAMA egg study their analyses can be found here. That’s because, for instance, there will be many other differences between people that eat many eggs and people that eat few other than their egg consumption. These other differences might be what’s causing higher death rates in people who eat a lot of eggs, rather than anything to do with the eggs themselves. The researchers point out that this has been a particular problem in some previous studies, and that this may have been a reason for inconsistency in the results of those studies. They have made considerable efforts to allow statistically for other differences in the new study. But they, correctly, point out that their own study is still not immune from this problem (known as residual confounding), and that therefore it’s impossible to conclude from this new study that eating eggs, or consuming more cholesterol in the diet, is the cause of the differences in cardiovascular disease rates and overall death rates that they observed. For observational epidemiological studies like this egg study which show increased risks that are only “modest” it is highly likely that the next such study will find something different. Finally, It’s important to remember that eggs, like most foods, are rarely consumed without accompanying food. This accompaniment is often bacon in the US. Eggs are often cooked in oil or butter and unless you cook them yourself you are unlikely to know the nature of the oil. Eggs are frequently components of recipes. We have no idea how these factors play into the results of the egg study. So, rather than drastically cutting egg consumption I propose that there be a drastic cut in the production of weak observational nutrition studies and a moratorium on inflammatory media coverage of meaningless nutritional studies. The skeptical cardiologist has finally prepared Dr. P’s Heart Nuts for distribution. The major stumbling block in preparing them was finding almonds which were raw (see here), but not gassed with proplyene oxide (see here), and which did not contain potentially toxic levels of cyanide (see here). During this search I learned a lot about almonds and cyanide toxicity, and ended up using raw organic almonds from nuts.com, which come from Spain. I’ll be giving out these packets (containing 15 grams of almonds, 15 grams of hazelnuts and 30 grams of walnuts) to my patients because there is really good scientific evidence that consuming 1/2 packet of these per day will reduce their risk of dying from heart attacks, strokes, and cancer. The exact components are based on the landmark randomized trial of the Mediterranean diet, enhanced by either extra-virgin olive oil or nuts (PREDIMED, in which participants in the two Mediterranean-diet groups received either extra-virgin olive oil (approximately 1 liter per week) or 30g of mixed nuts per day (15g of walnuts, 7.5g of hazelnuts, and 7.5g of almonds) at no cost, and those in the control group received small nonfood gifts). After 5 years, those on the Mediterranean diet had about a 30% lower rate of heart attack, stroke or cardiovascular death than the control group. It’s fantastic to have a randomized trial (the strongest form of scientific evidence) supporting nuts, as it buttresses consistent (weaker, but easier to obtain), observational data. I applied for a trademark for my Heart Nuts, not because I plan to market them, but because I thought it would be interesting to possess a trademark of some kind. The response from a lawyer at the federal trademark and patent office is hilariously full of mind-numbing and needlessly complicated legalese. Applicant must disclaim the wording “NUTS” because it merely describes an ingredient of applicant’s goods, and thus is an unregistrable component of the mark. See 15 U.S.C. §§1052(e)(1), 1056(a); DuoProSS Meditech Corp. v. Inviro Med. Devices, Ltd., 695 F.3d 1247, 1251, 103 USPQ2d 1753, 1755 (Fed. Cir. 2012) (quoting In re Oppedahl & Larson LLP, 373 F.3d 1171, 1173, 71 USPQ2d 1370, 1371 (Fed. Cir. 2004)); TMEP §§1213, 1213.03(a). The attached evidence from The American Heritage Dictionary of the English Language shows this wording means “[a]n indehiscent fruit having a single seed enclosed in a hard shell, such as an acorn or hazelnut”, or “[a]ny of various other usually edible seeds enclosed in a hard covering such as a seed coat or the stone of a drupe, as in a pine nut, peanut, almond, or walnut.”  Therefore, the wording merely describes applicant’s goods, in that they consist exclusively of nuts identified as hazelnuts, almonds, and walnuts. An applicant may not claim exclusive rights to terms that others may need to use to describe their goods and/or services in the marketplace. See Dena Corp. v. Belvedere Int’l, Inc., 950 F.2d 1555, 1560, 21 USPQ2d 1047, 1051 (Fed. Cir. 1991); In re Aug. Storck KG, 218 USPQ 823, 825 (TTAB 1983). A disclaimer of unregistrable matter does not affect the appearance of the mark; that is, a disclaimer does not physically remove the disclaimed matter from the mark. See Schwarzkopf v. John H. Breck, Inc., 340 F.2d 978, 978, 144 USPQ 433, 433 (C.C.P.A. 1965); TMEP §1213. If applicant does not provide the required disclaimer, the USPTO may refuse to register the entire mark. SeeIn re Stereotaxis Inc., 429 F.3d 1039, 1040-41, 77 USPQ2d 1087, 1088-89 (Fed. Cir. 2005); TMEP §1213.01(b). 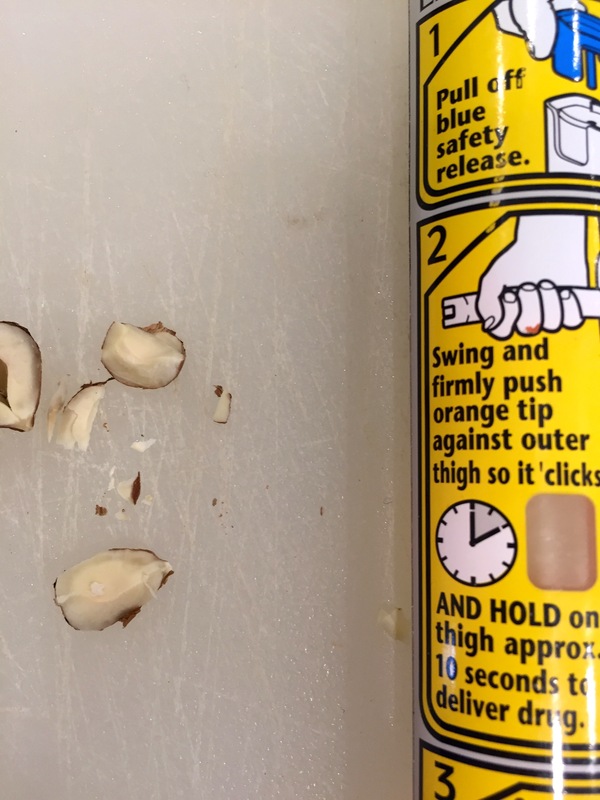 No claim is made to the exclusive right to use “NUTS” apart from the mark as shown." I’ve gotten dozens of emails from trademark attorneys offering to help me respond to the denial of my trademark request. Is this a conspiracy amongst lawyers to gin up business? The most recent examination of observational data performed a meta-analysis of 20 prospective studies of nut consumption and risk of cardiovascular disease, total cancer, and all-cause and cause-specific mortality in adult populations published up to July 19, 2016. If the associations are causal, an estimated 4.4 million premature deaths in the America, Europe, Southeast Asia, and Western Pacific would be attributable to a nut intake below 20 grams per day in 2013. If everybody consumed Dr. P’s Heart Nuts, we could save 4.4 million lives! Nuts are good sources of unsaturated fatty acids, protein, fiber, vitamin E, potassium, magnesium, and phytochemicals. Intervention studies have shown that nut consumption reduces total cholesterol, low-density lipoprotein cholesterol, and the ratio of low- to high-density lipoprotein cholesterol, and ratio of total to high-density lipoprotein cholesterol, apolipoprotein B, and triglyceride levels in a dose–response manner [4, 65]. In addition, studies have shown reduced endothelial dysfunction , lipid peroxidation , and insulin resistance [6, 66] with a higher intake of nuts. Oxidative damage and insulin resistance are important pathogenic drivers of cancer [67, 68] and a number of specific causes of death . Nuts and seeds and particularly walnuts, pecans, and sunflower seeds have a high antioxidant content , and could prevent cancer by reducing oxidative DNA damage , cell proliferation [71, 72], inflammation [73, 74], and circulating insulin-like growth factor 1 concentrations  and by inducing apoptosis , suppressing angiogenesis , and altering the gut microbiota . Although nuts are high in total fat, they have been associated with lower weight gain [78, 79, 80] and lower risk of overweight and obesity  in observational studies and some randomized controlled trials . 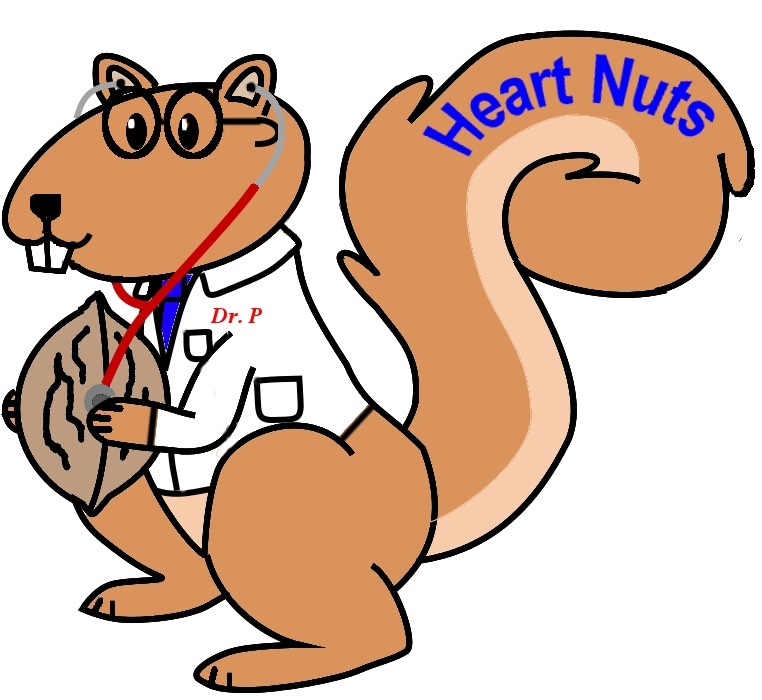 The skeptical cardiologist nut project (aka the nutty cardiologist project) now has a logo. Say hello to the world’s only walnut-auscultating promoter of nut consumption. Soon you will see his smiling face on the packets of nuts I’ll be handing out to help defeat cardiovascular disease. Special thanks to my wonderful Washington University computer-science major and bass guitar wiz daughter, Gwyneth, for creating the squirrel doctor during her winter break. I promised 10 bags of nuts and “oodles of glory” to the reader whose name I selected but I can’t identify who proposed Heart Nuts. Let me know who you are and I’ll get the nuts to you. Now I need a name for the squirrel. See here for my post on KIND bars versus Simply Nuts and here for my review of nuts, drupes and legumes and reduced mortality. N.B. Nuts are recognized as promoting reduced cholesterol, oxidative stress, and insulin resistance thereby reducing the risk of cardiovascular disease. I’ve focused on their cardiovascular benefits (perhaps mediated by dietary fiber, magnesium, polyunsaturated fats, vitamin E, and antioxidants) but recent studies suggest other health benefits that could contribute to improved longevity. Nuts contain bioactive compounds both known (ellagic acid, anacardic acid, genistein, resveratrol, and inositol phosphates) and unknown which may reduce the risk of cancer or other chronic diseases. A recent meta-analysis found that consuming one serving of nuts per day was associated with a 15% lower risk of any cancer and a 22% lower risk of dying from any cause. Embrace the nuts I say! Tonight we will lose an hour of our lives when we observe Daylight Savings Time (DST). Media reports suggest that DST, beyond robbing of us that nocturnal hour in the spring are also increasing our risk of heart attack (myocardial infarction or MI) and death. Is this a valid concern or just media hype on a slow news day? Scientific studies on this topic are mixed. A recent study from Finland found MI rates increased 16% on the Wednesday after spring DST time change and dropped by 15% on the Monday after fall DST time change. A 2015 German study found no difference in MI rate in the 3days or 1 week after spring or fall DST transitions. However, some American studies have detected a bump in MI rate on the day after DST transition in the spring and a similar drop in MI rate on the day after the fall DST change. Manipulations of the sleep–wake cycle have been linked to imbalance of the autonomic nervous system, rise in proinflammatory cytokines and depression so presumably the additional disruption created by DST adds to this effect. However, the data suggest that this very weak effect means only that if you were going to have an MI in the next week, after DST it is more likely to occur on the Monday of that week than on another day. Your overall risk of MI is not changed. From a public health standpoint the major conclusion is that emergency rooms and cath labs should consider increasing staffing by 24% on the Monday after the spring DST time change. I don’t think this is a significant factor for my patients. We have to deal with events and stressors that influence our sleep-wake cycle constantly. Good planning and sleep hygiene are the keys to success and reducing stress. So, fear not the grim reaper as you set your clocks forward tonight. My pediatrician was promptly called, drove over, picked me out of the street and (legend has it) with one hand on the steering wheel and the other jabbing me with epinephrine drove me to the local hospital (apparently ambulances were not invented at this time). There I spent several days in an oxygen tent recuperating. To all whom I gave this seemingly erudite explanation I owe an apology for I have learned the earth-shattering truth that pecans are drupes! They are no more a nut than an almond is! In fact, even walnuts are not nuts as hard as that is to believe. Pecans, walnuts and almonds are all drupes. Why, you may wonder, is any of this botanical folderol of any relevance to cardiology? For those paying attention to media reports on the latest food that will either kill you or make you live for ever you may already know the answer. This paper published in JAMA made big headlines. Jane Brody of the New York Times wrote a piece extolling the virtues of nuts entitled “Nuts are a Nutritional Powerhouse”. Medical New Today wrote “Eating Nuts Linked to 20% Cut in Death Rates”. These findings follow another large observational study published in 2013 which also found (in American doctors and nurses) an inverse relationship between nut consumption and mortality. We also have a very good randomized trial (the PREDIMED study) that showed that the Mediterranean diet plus supplementation with extra-virgin olive oil or mixed nuts performed much better than a control diet in reducing cardiovascular events. After 5 years, those on the Med diet had about a 30% lower rate of heart attack, stroke or cardiovascular death. The evidence supporting “nut” consumption as a major part of a heart healthy diet is pretty overwhelming. But what is a nut and which nuts or nut-like foods qualify? Nut-Generally has a hard outer shell that stays tightly shut until cracked open revealing a single fruit inside. Examples are hazelnuts and acorns. Drupe-Has a soft, fleshy exterior surrounding a hard nut. Classic drupes are peaches and plums with interior nuts so hard we won’t eat them. Examples are pecans, almonds, walnuts and coconuts. Legume-generally has a pod with multiple fruit which splits open when ready. Examples are peas, carob, peanuts, soybeans and beans. What Nuts Were Consumed in Studies Showing Benefits of Nuts? After initial surveys, the questionnaires split out peanut consumption from “tree nut” consumption and whether you ate peanuts or nuts the benefits were similar. Thus, for the most part, participants were left to their own devices to define what a nut is. Since most people don’t know what a true nut is, they could have been eating anything from almonds (drupe related to peaches) to hazelnuts (true nut) to a pistachio “nut” (drupe) to a pine “nut” (nutlike gymnosperm seed). The nutrient components of these nuts varies widely but one consistency is a very high fat content. For this reason, in the dark days when fat was considered harmful, nuts were shunned. However, in our more enlightened era we now know that fat does not cause heart disease or make you fat. A one ounce portion of pecans contains 20.4 grams of fat (11.6 arms monounsaturated and 6.1 polyunsaturated) so that 90% of its 204 calories come from fat. Nuts, of course, also contain numerous other biologically active compounds that all interact and participate in the overall beneficial effects that they have on cardiovascular disease and mortality. They are a whole, real food which can be eaten intact without processing and these are the foods we now recognize provide the best choices in our diets, irrespective of fat or carbohydrate content. They are also convenient, as they are easy to store and carry with you, providing a perfect snack. Hazelnut Death Experiment (Don’t try this at home!) A single hazelnut was partitioned into halves, quarters, slivers and little tiny bits. Progressively larger portions were consumed at 5 minute intervals. An Epipen (right) was available in case of anaphylaxis. It turns out, that my attempts to put pecans and walnuts in to a specific family of nuts that increased my risk of dying if I consumed them were misguided. In fact, I did an experiment recently and consumed a true nut (a hazelnut) and found I had no reaction. I’m not allergic to nuts!!! In the world of allergic reactions, thus, there is no particular value to partitioning nuts from drupes from legumes. Similarly, for heart healthy diets, it doesn’t matter if you are consuming a true nut or a drupe as long as you think of it as a nut. Consume them without concern about the fat content and consume them daily and as along you are not allergic to them they will prolong your life.